6 Comments Published by kim on Wednesday, December 19, 2007 at 10:07 PM. disclaimer: expect a lot of randomness here - i've had a gazillion updates floating around in my head recently but only now have the time to post some. on the plus side, my work-work is almost done, 5 paintings just got finished, gifts are done and wrapped, and my to-do list is finally almost empty. yahoo! so our little girl has officially moved to the "big girl room" in preparation for baby #2's arrival. although her new room has been ready for quite some time, i finished moving the rest of the clothes, toys, and decorations over on monday, and emmy got her first chance to sleep in the big bed that night. i figured we'd sing an extra song or two, or maybe even toss in an extra story to commemorate the occasion. instead, we read one book, sang one song (not the usual three) and was quickly told "get off the bed, mommy. time to go sleep." snif. and in true emmy fashion, yet another milestone was accomplished with little fanfare. she loves the new room, adores the big bed, and has even slept late every day since the move! the only slight hiccup is that it takes her a good hour to fall asleep at naptime, and that's only after a couple of stern warnings that it's quiet time. and that she better stop walking / running / bouncing on the bed. and now i'm addicted to our new video monitor. seriously, if i'm still watching her when she's sixteen, someone shoot me. but for now, i want need my emTV. me: "those are ferrets, honey." em: "actually, it's a dog." me: "no, that animal is a ferret. it's long and - "
um, okay. i stand corrected. remember my obsession with prizey? i haven't been able to check it in ages but was extremely surprised to find that i won an old contest that i entered back in november! courtesy of the hostess with the mostess, i'll be receiving a cool new pulp factory calendar soon! it's no surprise that i picked the "a new baby's life calendar" and the timing couldn't have been better. thanks, jenn! and i'm so excited about my NaBloPoMo painting prize in the works - matt is doing an original 8"x10" canvas for me. can you guess what i've requested? there's a certain movie that's been a favorite since childhood... and now em's inherited my love for the main characters too... mei and satsuki would be so proud! hint, hint! oh, speaking of new babies, i've been feeling a little panicked nesty lately. i'm consumed with the thought that baby #2 will come early, throwing off our oh-so-carefully-planned delivery. in the past week, i've washed loads of em's old clothes; the nursery is now stocked with EVERYTHING for 0-9 months. i've purchased diapers in sizes newborn to 1-2. wipes are coming out of my ears. and i have more nursing pads that you can shake a stick at. but i'm keeping my fingers (and legs) crossed that we'll make our scheduled delivery date. i just gave copies of the green frogs: a korean folktale to the kids in our korean playgroup. the drawings are wonderfully quirky and emmy keeps begging us to read the tale. while it does mention death (which may be an early / confusing concept for a child so young), i highly recommend the book. in fact, blair and i both remember hearing the tale from our respective mothers growing up. kids, do what your moms tell you to do, okay? "emmy's not a piggy. piggy is a piggy. emmy is a piggy!" "i like red... because... i like blue"
"sing twinkle [twinkle, little star], mommy. i need to go to sleep." 4 Comments Published by kim on Tuesday, March 27, 2007 at 1:46 PM. ... also known as "all the books that kim has never read" or "who the heck came up with this list?!" 2 Comments Published by kim on Tuesday, March 06, 2007 at 10:52 PM. a few weeks ago, i posted about the rice daddies' blogaversary book review contest. i couldn't resist entering and lo and behold, i was one of the winners! the generous folks at kane/miller publishing sent each of us 12 participants one free book from their catalog of asian kids' literature. to say thanks to both the rice daddies and kane/miller, here's my review of... *drumroll please*... the story of cherry the pig. cherry the pig is a very happy pig. she loves desserts so much that she bakes an enormous sweet every afternoon to eat all by herself (after all, she is a pig!). one day, a family of mice sneak into her kitchen and nibble on her freshly baked apple cake. after overhearing them say that it tastes "incredible! ", cherry decides to enter her cake in the great harvest festival bake-off. all is going well until she runs into those mice again, who now proclaim how "incredibly awful!" cherry's cake tastes! embarrassed and disheartened by the misunderstanding, cherry hides under a tree until she's surprisingly awarded the grand prize of the bake-off. curious to understand why the mice didn't like her cake, cherry tastes their bag of left-behind biscuits and realizes that mice prefer "very hard, very salty, very cheesy" instead of light and fluffy, cinnamon sweet goodness. aha! with her newfound fame, cherry goes on to open her very own bakery filled with desserts galore... and some very hard, very salty, very cheesy biscuits too. i love this book for many reasons. at some point, every child will come across a misunderstanding and feel the same emotions of sadness and embarrassment that cherry felt. this story is a great way to talk through that experience and help kids understand that words can be hurtful, and that sometimes people say things because they may not understand or be familar with something that you are / have. cherry learned that the mice have a different opinion about what tastes good, and she opened herself to trying something new (in this case, their food). i think this book will encourage children to be more open-minded about things that aren't familiar (whether it be food, race, gender or anything!) and reinforce the idea that their words can have an impact on others and should therefore be chosen with some thought. 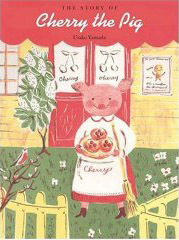 to complement this great story, utako yamada's illustrations evoke feelings of old-fashioned simplicity and happiness. her palette of only red, yellow, green and brown remind me of many books i read as a child, and the charming animal drawings seem very welcoming to little ones. i look forward to sharing this book with emmy when she's a little older (although she definitely paid attention when i read it for the first time today too!). and if all that wasn't enough, here's the icing on this cake: kane/miller has provided a free activity sheet to go along with this book! it has some great discussion topics, fun games, a word search, and most importantly, an official apple cake recipe to help you get the most from their book. i can't wait until emmy's old enough to help her mama make an apple cake! (seriously, how can you go wrong when the recipe says to "put everything in a big bowl and mix it up with your hands"?!) for those of you that can't wait, here's the recipe - i think i'll try it soon! Preheat the oven to 350 degrees and then... put everything in a big bowl and mix it up with your hands (no, really!). Bake in an ungreased 9 x 13 pan for an hour, and let it cool (if you can wait) before cutting. *Cherry doesn't share her recipes, but this one is almost as good as hers! 0 Comments Published by kim on Tuesday, January 23, 2007 at 4:59 PM. emmy insisted that i read one of her favorite books earlier today (no surprise there, miss bookworm!). we've read kiss good night since em was still in my tummy so i happily obliged. but today, when we got to the page where mrs. bear remembers that she needs to kiss sam good night, emmy puckered up sweetly and gave me a kiss on the lips! and when sam cried "again! ", i got a second surprise kiss too! sweetie pie, how did you know that your mommy needed that today?